The speaker for our June 2010 lecture was Nick Hewitt from the Astronomy Section of Northamptonshire Natural History Society who specializes in deep sky objects. A planetary nebula is an interstellar cloud of dust and ionized gases, surrounding a central star that has come to the end of its life, so to speak. The star´s central core will have run out of hydrogen fuel that powers its nuclear reactions and as it switches to fusing helium it reaches a rather unstable state. Its outer layers pulsate and lose copious amounts of material as powerful stellar winds emanate from the star. Radiation pouring from the central star hits the surrounding gases, effectively lighting them up in a whole range of hues. The word "nebula" comes from the Latin for cloud and the first person to identify a planetary nebula was Charles Messier in 1764. He gave it the designation M27 and it is more popularly known as The Dumbbell Nebula. However, it was William Herschel who actually coined the term as he thought they resembled his newly discovered planet Uranus. In relation to astronomical timescales a planetary nebula is quite an ephemeral object only lasting tens of thousands of years compared with the billions of years that a star such as our Sun lives. Typically it is about a light-year in diameter, with a mass between a tenth to one solar mass. This means that the gas and dust is spread extremely thinly so that there are only 100 to 10,000 particles in every square centimetre. There are around 3,000 planetary nebulae in the Milky Way and are mostly found in the galactic plane and towards the centre. Most are not symmetrical and are classified into three main types: spherical, elliptical and bipolar. The most widely accepted classification of planetary nebulae was devised by the Russian astrophysicist Vorontsov- Velyaminov in 1934, namely: Stellar Image, Smooth Disk (3 types), Irregular Disk (2 types), Ring, Irregular Form, and Anomalous. It is not properly understood why they have this diversity of shape but part of the reason may be simply due to the angle that we view them from. 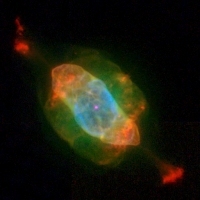 One of the more complex planetary nebulae is The Saturn Nebula (NG 7009) pictured above. It was given its name by the English astronomer, Lord Rosse, due to its resemblance to the planet. It has a central bright area with two jets ending in two large blobs of gas known as ansae. It also has a halo, multiple shells, and small scale filaments and knots.